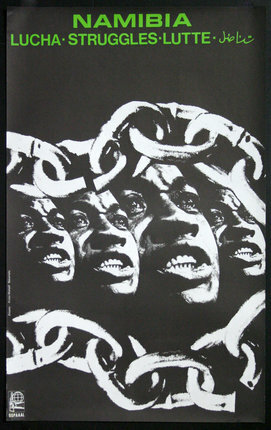 Powerful 1978 poster showing the chains of colonial rule. South Africa began imposing apartheid, its codified system of racial segregation and discrimination, on South West Africa (Namibia) during the late 1940s. By the 1960's South West African People's Organisation (SWAPO) made determined attempts to establish indigenous political structures for an independent South West Africa. Caught in a proxy power struggle between Soviet and US cold-war conflict, Namibia received military aid from the Soviets, Cuba, and Angola which positioned their liberation movement within the socialist bloc by 1975. The Organization of Solidarity with the People of Asia, Africa and Latin America (OSPAAAL) created many powerful liberation posters like these to promote the causes of socialism and communism in the Third World. Much like South Africa, Namibia gained it's independence in 1990 and currently maintains a multiparty democracy.